I'm excited to be staying in tonight. You see, for the past two weeks we had been eating out every night. As much I enjoy the Minneapolis restaurant scene and eating out in general- especially now that it's almost summer and outdoor dining is the rave- the comfort of my apartment and my little kitchen is more appealing right now. 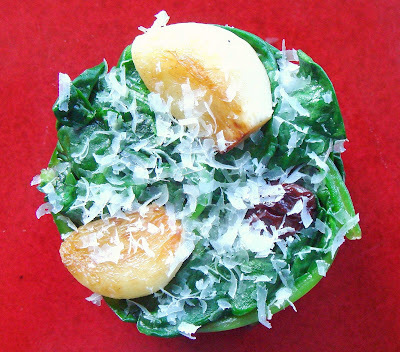 On the menu tonight: sauteed spinach with whole garlic and raisins. Not very alluring, I know, but very simple and delicious. Just what I want after a slew of large and involved meals. 1. In a skillet set over medium high heat, add two tablespoons vegetable oil. Add the garlic and cook for three to four minutes, until they turn lightly brown. 2. Add the raisins, cook for another minute or so until they plump up. Now, add the spinach. Cook until they wilt, season with enough salt to taste, and serve with grated parmesan on top. Eating out is great but I can fully understand your need to take it down a bit and re-balance! This looks like a great dish to refresh the appetite. The dish is really appealing! Great combinations of ingredients! Thanks! Tangled Nooodle: Yes, it really did refresh my appetite for home cooked meals. Gera: Home provides a different dimension to dining. It definitely makes it special. Gail: Thanks! I tried to keep it simple, and the combination worked well together. MMMMM....simple yet so flavorfull with excellent ingredients!!! Yummie all the way! reminds me of the pizza from whole foods with whole garlic as a topping. Sophie, yes cooking with few and simple ingredients makes cooking interesting. Marina, I know exactly the pizza you are talking about. We still get it once a month or so. Roasted whole garlic is an entirely different food than fresh garlic. 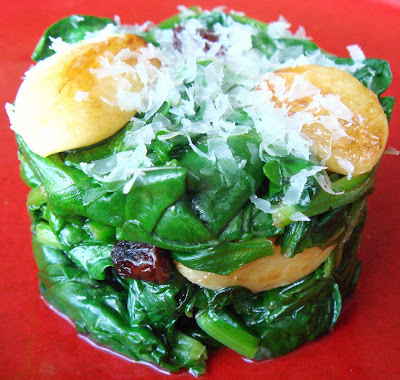 this looks really tasty - I could be biased since I love spinach!